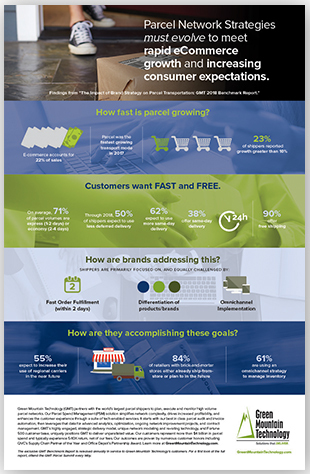 This infographic features data from our research report: The Impact of Brand Strategy on Parcel Transportation: GMT 2018 Benchmark Report. It was developed exclusively for GMT customers to provide thought leadership as it relates to their parcel planning. A preview of the key findings is accessible by downloading this infographic. Download the 2018 Parcel Trends Infographic now.